17566 Acting Corporal Thomas Cox of the 8th Battalion, the Devonshire Regiment. Son of John and Maud Cox. Born in Beaford in 1895. Died 28 March 1917 aged 22. 26073 Private Walter Heard of the 9th Battallion, the Devonshire Regiment. Son of Robert and Betsy Hear,. Born in Dolton in the March Quarter of 1882., Died 2 April 1917 aged 35. 265377 Private John Walter Newcombe of the Devonshire Regiment. Son of William and Eliza Newcombe; husband of Annie Newcombe, Born in Pilton 3 November 1878. Date of death not known. 9500 Private Edgar Boundy Wills of the 1st Battalion, the Devonshire Regiment. Son of George and the late Rose Wills; brother of Lionel (see below). Born in South Molton in 1894. Died 20 October 1918 aged 24. 10129 Private Lionel Wills of the 8th Battalion, the Devonshire |Regiment.. Son of George and the late Rose Wills; brother of Edgar (see above). Born in South Molton in 1892. Died 25 September 1915 aged 23. 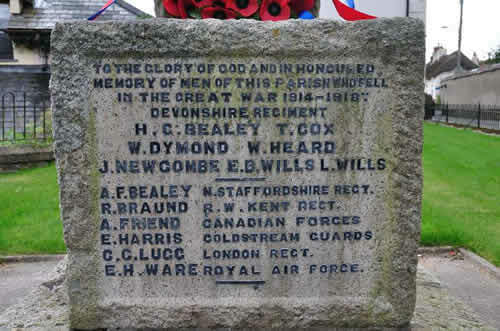 The following men are listed below the Devonshire Regiment men. 58844 Private Arthur Frederick Bealey of the East Yorkshire Regiment . Son of John and Kate Bealey; husband of Florence Bealey. Born in Dolton in the June Quarter of 1889. Died 9 December 1919 aged 30. 241387 Private Reginald Braund of the 1st Battalion, the Queen's Own, Royal West Kent Regiment. Husband of Minnie Braund. Born in Monkleigh in the March Quarter of 1887. Died 7 November 1917 aged 30. 216124 Private Arthur Friend of the 78th Battalion, the Canadian Infantry. Son of Sarah and the late Enoch Friend. Born in Dolton in the September Quarter of 1877. Died 9 April 1917 aged 40. 6709 Sergeant Ernest Harris of the 1st Battalion, the Coldstream Guards. Son of John and Susannah Harris of Dolton. Born in Dolton in the June Quarter of 1893. Died 25 August 1914 aged 27. 3557 Private Charles Clifford Lugg of the the London Regiment (the Civil Service Rifles). Son of Charles and Edith Lugg. Born in Dolton in the December Quarter of 1896. Died in the December Quarter of 1918 aged 19. 89841 Air Mechanic 3rd Class Edwin Harry Ware of the Royal Flying Corps, 62 Squadron. Son of James and Martha War of Dolton. Born in Dolton in the September Quarter of 1885. Died in the December Quarter of 1918 aged 33.